Characteristics: Intense ruby colour with violet reflexions. In the nose spices, green pepper and vanilla, very long and fine perfumes of fruit of wood. To the palate it is an elegant, balanced wine. The tannins give a sensation of freshness, long and with sweet final. "Doctorwine" has rated the wine "Le Macchiole Bolgheri Rosso, Tuscany, Italy" from the vintage 2010 on 14.08.2013 with 90 of 100 points.
" Blendnd of Cabernet Sauvignon and Franc, Merlot, Syrah and a bit of Sangiovese with the grapes grown in the vineyards of Casa Vecchia, Vignone and Madonnina, in the town of Castagneto Carducci. It has a very intense, ruby color. A bouquet of black cherry, cacao and some hints of mint, while the taste is solid, full-bodied and warm.Serve at 18Â°C with roast lamb and Bolognese lasagne. " 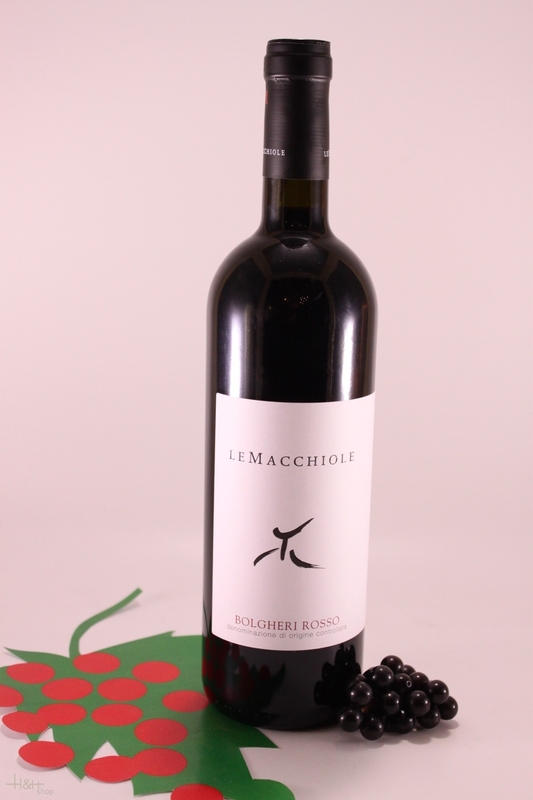 "Jeannie Cho Lee" has rated the wine "Le Macchiole Bolgheri Rosso, Tuscany, Italy" from the vintage 2010 on 25.11.2012 with 85 of 100 points.
" Modern red blend of Merlot, Cabernet and Syrah. Not overly extracted nor too strong. Blackberry and cassis fruit. Good balance, well made, full bodied red. Tasted in: Hong Kong, China. Maturity: Drink. " "The Wine Front" has rated the wine "Le Macchiole Bolgheri Rosso, Tuscany, Italy" from the vintage 2015 on 05.11.2017 with 92 of 100 points. "Wine & Spirits Magazine" has rated the wine "Le Macchiole Bolgheri Rosso, Tuscany, Italy" from the vintage 2014 on 01.04.2017 with 90 of 100 points. 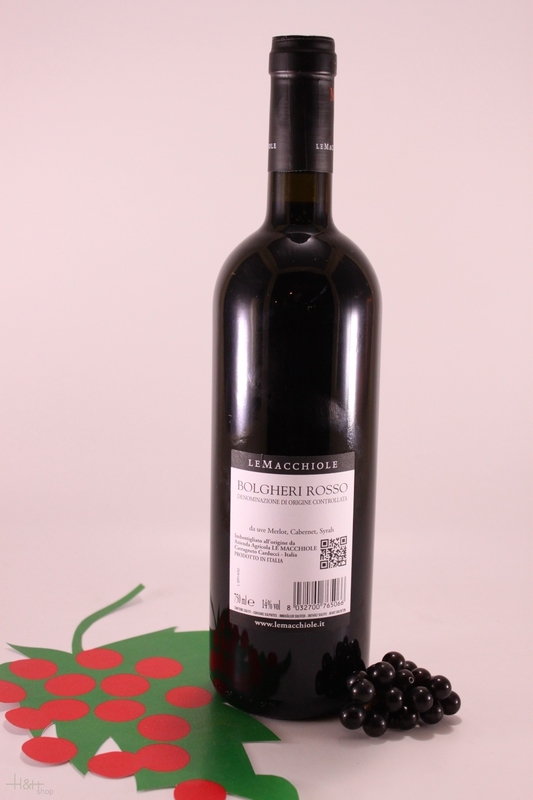 "Luca Gardini" has rated the wine "Le Macchiole Bolgheri Rosso, Tuscany, Italy" from the vintage 2014 on 01.11.2016 with 89 of 100 points. "Falstaff Magazin" has rated the wine "Le Macchiole Bolgheri Rosso, Tuscany, Italy" from the vintage 2014 on 12.10.2016 with 90 of 100 points. "Wine Spectator" has rated the wine "Le Macchiole Bolgheri Rosso, Tuscany, Italy" from the vintage 2013 on 31.08.2016 with 91 of 100 points. "Wine & Spirits Magazine" has rated the wine "Le Macchiole Bolgheri Rosso, Tuscany, Italy" from the vintage 2013 on 01.04.2016 with 91 of 100 points. "Vinous Antonio Galloni" has rated the wine "Le Macchiole Bolgheri Rosso, Tuscany, Italy" from the vintage 2013 on 01.10.2015 with 91 of 100 points. "Falstaff Magazin" has rated the wine "Le Macchiole Bolgheri Rosso, Tuscany, Italy" from the vintage 2013 on 04.09.2015 with 91 of 100 points. "Wine Spectator" has rated the wine "Le Macchiole Bolgheri Rosso, Tuscany, Italy" from the vintage 2012 on 31.07.2015 with 90 of 100 points. "Wine Enthusiast" has rated the wine "Le Macchiole Bolgheri Rosso, Tuscany, Italy" from the vintage 2012 on 11.01.2015 with 93 of 100 points. "Falstaff Magazin" has rated the wine "Le Macchiole Bolgheri Rosso, Tuscany, Italy" from the vintage 2012 on 05.09.2014 with 90 of 100 points. "Wine Enthusiast" has rated the wine "Le Macchiole Bolgheri Rosso, Tuscany, Italy" from the vintage 2011 on 05.01.2014 with 91 of 100 points. "Wine Spectator" has rated the wine "Le Macchiole Bolgheri Rosso, Tuscany, Italy" from the vintage 2011 on 31.10.2013 with 93 of 100 points. "Falstaff Magazin" has rated the wine "Le Macchiole Bolgheri Rosso, Tuscany, Italy" from the vintage 2011 on 30.08.2013 with 90 of 100 points. "Wine & Spirits Magazine" has rated the wine "Le Macchiole Bolgheri Rosso, Tuscany, Italy" from the vintage 2010 on 01.04.2013 with 93 of 100 points. "Wine & Spirits Magazine" has rated the wine "Le Macchiole Bolgheri Rosso, Tuscany, Italy" from the vintage 2011 on 01.04.2013 with 92 of 100 points. "Wine Enthusiast" has rated the wine "Le Macchiole Bolgheri Rosso, Tuscany, Italy" from the vintage 2010 on 04.01.2013 with 93 of 100 points. "Falstaff Magazin" has rated the wine "Le Macchiole Bolgheri Rosso, Tuscany, Italy" from the vintage 2010 on 28.11.2012 with 90 of 100 points.